Beautiful Newport, Oregon. Home of the famous Newport Aquarium and former home of Keiko the orca (from the movie Free Willy). 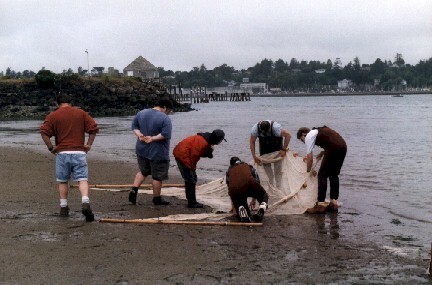 This coastal Oregon town is located on Yaquina Bay, and has been the site of frequent collecting and nature trips. 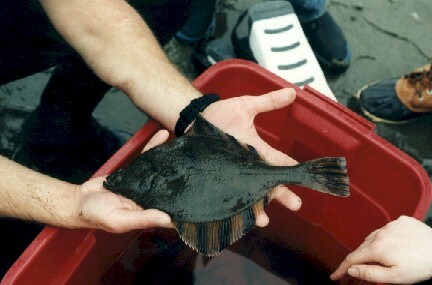 This time we seined the bay and found several interesting species of fish. 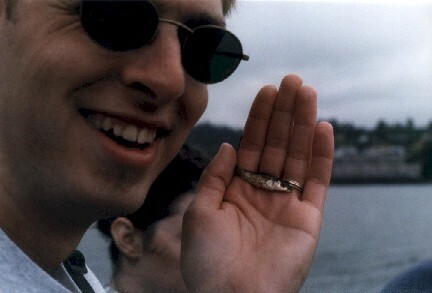 These pictures are from a 1997 and a 1998 trip. Left to right: Don Winn, curious local kid, Joe Middleton, Steve Bobko (Oregon State University graduate student and our leader on this trip), Pat McDonald, Amy Leudtke, Layn Leudtke, and an unknown diver. 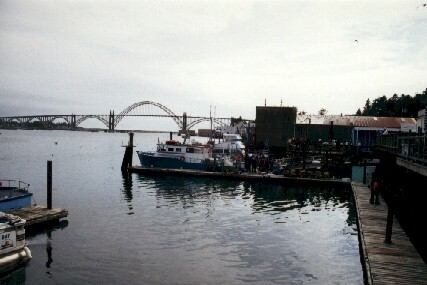 The Yaquina Bay bridge in the background leads to the Pacific Ocean. 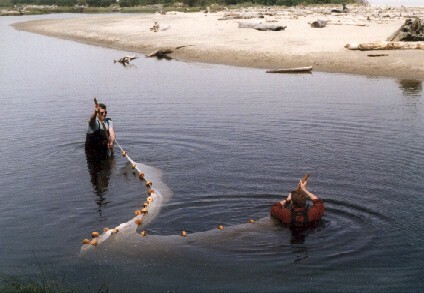 Layn and Amy Leudtke dragging a seine. Newport is in the background. We also found an interesting jellyfish which we didn't photograph. 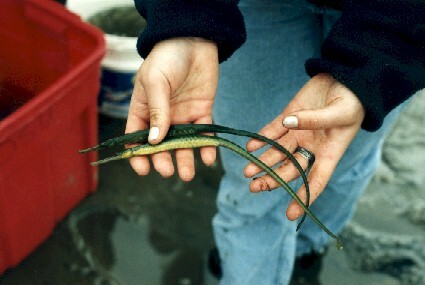 It was Velella velella, called the "by-the-wind sailor". The animal is an open ocean drifter which has a sail-like structure on an air-filled float. 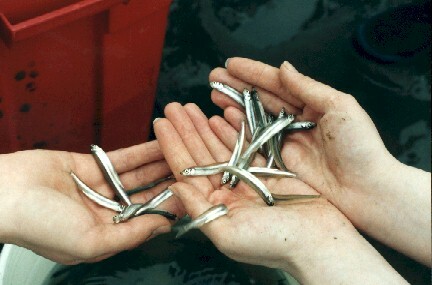 They are only 4 - 6 cm in length and sometimes float into quiet bays. 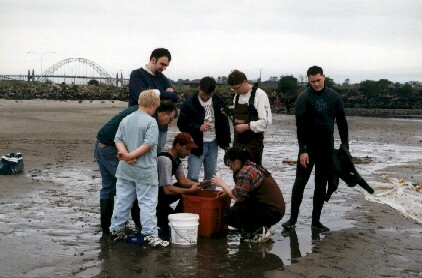 Layn (Mr. Stickleback) wanted to see some threespine sticklebacks, so in the water he and Dan Logan (Pacific Northwest Regional Representative) went in a stream just south of Newport. Now, what are those waders supposed to do, Layn? People are busy on the fishing docks. Tourists are observing what they're doing. 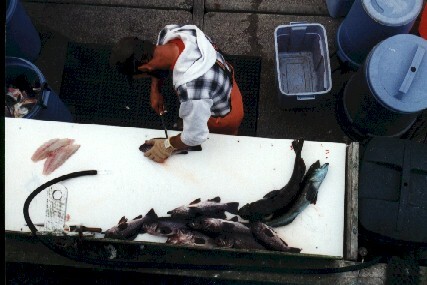 Cleaning fish just brought in from charter boats. These are rockfish and lingcod. 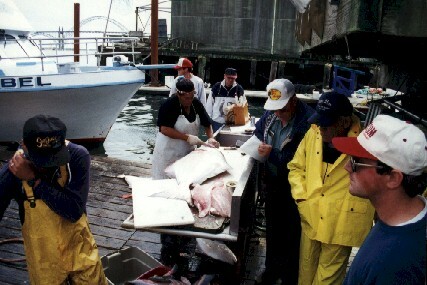 The halibut fishery was open this day and here are some being cleaned. 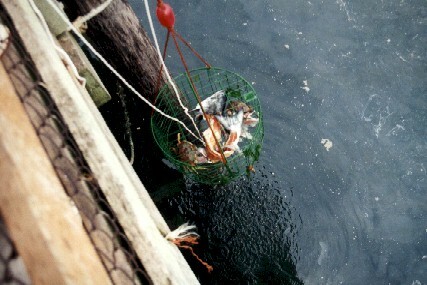 Fish scraps are used for crab bait. 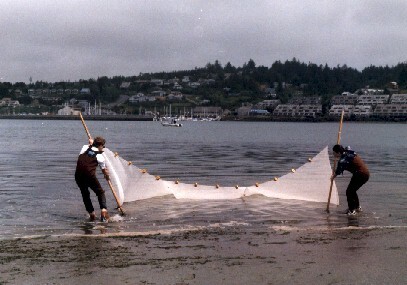 Dungeness crabs Cancer magister are being hauled up in a trap.